My husband’s daughter has just had a baby. Yay, woo-hoo, congratulations. No, really, I’m very happy for them. But can I be excused from being too deliriously enthusiastic about it? And is it okay if I don’t really consider myself a grandma yet? 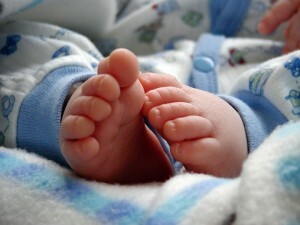 The birth of a baby is always a happy and joyous occasion, and this is as well, but there are a few considerations here. I wanted more kids, myself. My husband did not. I’m still young enough to (possibly) have one. But that option if off the table in deference to my husband’s wishes. So it might come as no surprise that seeing my husband masterfully hold and fuss over a cute baby is a bittersweet experience. The new mom was long gone from the nest when I met her dad, she lives out of state, I’ve only met her a few times, and during those times she was a little rude to me. And she was a LOT rude to my tween daughter. My husband insists that her behavior was just normal jealousy and that it wasn’t as bad as I perceived. But let’s just say she and I haven’t really bonded. My daughter made a comment that made me stop and think. “Dad [my husband] better get that excited when I have a baby.” (Apparently my daughter is jealous, too.) It suddenly occurred to me that if I start conspicuously calling myself a grandma and referring to my stepdaughter’s baby as my “first grandchild,” it will take something away from my own daughter. It might seem hypocritical for me to not get overjoyed about my step-grandchild when I expect my husband to do so about his step-grandchild (when the day comes), but the circumstances are very different there. My daughter thinks of my husband as her dad. My stepdaughter does not think of me as her mom (I don’t think she even thinks of me as her father’s wife). By the time my daughter has kids, my husband will have been acting as her father for over ten years (assuming we’re still together then; stepparent issues and, apparently, step-grandparent issues, are fraught with marital peril). I barely know my stepdaughter. How could I possibly feel grandmotherly, except in a generic sense, towards her child? He’s an adorable baby (How could he not be? He’s my husband’s descendant! ), and I’ll be delighted to hold him. I’ll do a fantastic job looking after him if called upon to do so. I want to do everything a good grandmother should do. I’m even fine with him calling me Grandma. But in my heart, my first grandchild has not been born yet. So don’t ask me what it feels like to be a grandma. This entry was posted in Children, Family, Values. Bookmark the permalink. Cell Phones for Kids – Good or Bad?